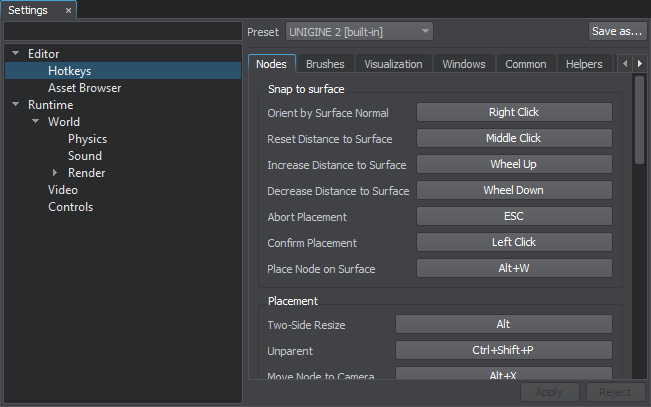 The Settings window provides quick access to general editor and run-time settings, including hotkeys and controls, general physics, sound, render and video settings. 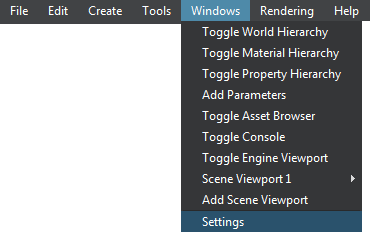 Via the Settings window, you can save and load presets for general physics, sound and render settings. The presets are stored in files with the corresponding extensions: *.physics_settings, *.sound_settings, *.render_settings. By using this capability, you can prepare settings presets with low, medium, high and ultra settings for different devices. Go to the section with the required setting (Physics, Sound or Render) and click Save in the upper right corner of the window. In the file dialog window that opens, specify a folder and a name for the preset file and click OK. The file with the corresponding extension will be created in the target folder and will be available in the Asset Browser immediately. Go to the section with the required setting (Physics, Sound or Render) and click Load in the upper right corner of the window. In the file dialog window that opens, choose the preset file and click OK. The settings from the chosen file will be loaded.